My name is Thomas Kube (Berlin Signing Choir member). How you can see above this video there is another video for all Deaf who sign in German Sign Language. Now I will transform the content of that video in International Sign. Ok for you? You know? Allover the world there are so many offers and programme for hearing people. Different kinds of music, theatre and many other things. And for the Deaf? Not so much. That’s why we, the Berlin Signing Choir, invented something new. Something for the Advent. You know what it means? You know the wreath with the four candles? We invented the „Advent Signing Poetry“. Great, isn’t it? The entrance is free and after the event you have still time for some conversation and a little snack. And then there is another small building aside the tall new tower. That’s the chapel and in there will take place our event. Our programme will be various: naturally we will show you Signing Songs, theatre, pantomime and many other things. If you also like really to take part in one or some more songs together with us and it’s your dream already for a long time to express you in Signing Poetry on stage, no problem: welcome! It’s all the same if you are Deaf or hearing, the only important thing is that you speak Sign Language. If then you do a good job on stage you will get a little surprise. So if you want to take part in our Signing Poetry for a little part please write us an e-mail before the event. The e-mail address you can find here: gebaerdenchor@hoer.ekbo.de. In any case you can find more information in this text under the video. We would be glad if came also hearing people without Sign Language knowlegde to get to know our culture. Don’t be afraid, we interprete also all moderation parts from Sign Language in German spoken language and all texts we will show in Signing Poetry we have written down for you. We hope and would be very very happy to see many of you at our event and we are sure you will enjoy our programme and our poetry. 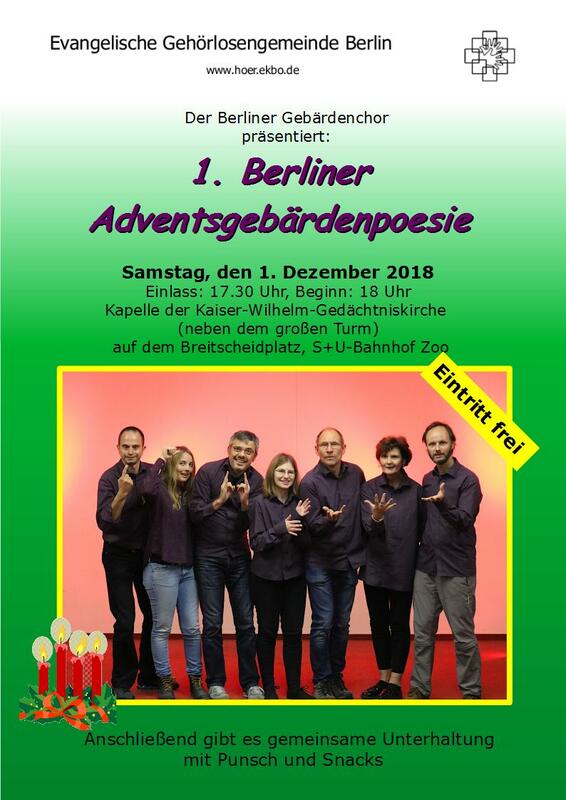 So welcome to the 1st Berlin Advent Signing Poetry, then we will meet.